Whether she’s cooking up a storm or tearing up the dancefloor, Ash Pollard is guaranteed to get your attention! Born in Tassie and raised on the Gold Coast, the now Melbourne-dwelling foodie first made a name for herself in 2015, when she competed in the sixth season of My Kitchen Rules. 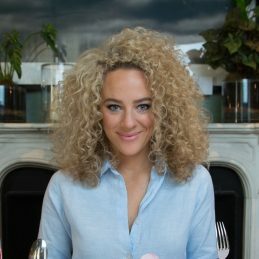 Bursting onto our screens with her big hair and even bigger personality, Ash quickly became a household favourite, dazzling MKR judges and audiences alike with her elite culinary skills and sass, which inevitably took her all the way to the series finale. Later that year, Ash swapped the kitchen for the dancefloor and joined the 2015 series of Dancing with the Stars. Proving to be quite the dancer, Ash’s vibrant character and killer moves once again saw her to the series grand finale. Ash also had the pleasure of co-hosting the 2015 Seven Network’s New Year’s Eve special, ending an already jam-packed year with a bang. She joined Sunrise’s James Tobin and Seven News reporters Nathan Templeton, Emily Angwin and Paul Dowsley for the special evening broadcast, including the Melbourne fireworks. But of course, that’s not all. After mastering both cooking and dancing, our adventurous Ash decided to take on the South African jungle, boldly stepping up for Season 3 of I’m a Celebrity… Get Me Out of Here!, where she competed for her chosen charity, Beyond Blue. Following on from Ash’s time in the jungle, Ash teamed up with fellow jungle-mate, Steve Price, joining him for his evening show Nights with Steve Price. Broadcasting across all 56 of Macquarie Media’s stations— including the no.1 rating 3AW in Melbourne and 2GB in Sydney—Ash chatted all things food, wine and fine dining. In addition to her television experience, Ash entered an exciting new partnership with Yahoo7. As an ambassador, Ash keeps audiences entertained with exclusive online content featuring special guests and plenty of mouth-watering recipes. Most recently, Ash has relocated to the Central Coast, taking up an exciting role hosting breakfast radio for 101.3 Sea FM. This will see Ash hosting alongside “Gawndy” Monday- Friday from 5:30-9AM. With her signature locks, vibrant personality and diverse talents, it’s no wonder the Australian public can’t get enough of Ash – and with her growing popularity, we think it’s safe to say she’ll be sticking around for a while.